Tens of thousands of companies apply for L-1 visas every year to make their businesses run smoothly. L-1 visas come in various types, but let’s focus on L-1A visas that allow managers and executives from foreign offices to live and work in the United States for up to 7 years. Here’s an example org chart. To get an L1 visa, the company needs to file Form I-129 (not the individual who will receive the visa). This puts a big burden on HR personnel to get the details right the first time. If the first application doesn’t include everything clearly (like an org chart and job description), then the USCIS can send a dreaded Request for Evidence (RFE) that can postpone the process even further. 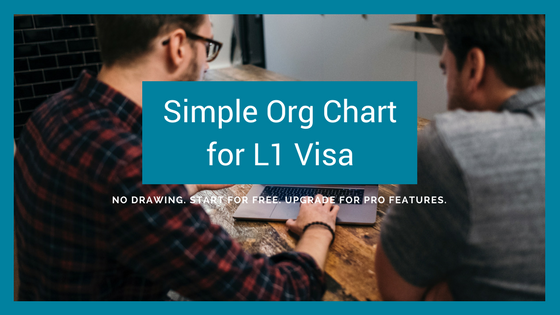 Clarity is key when making an org chart for an L-1 visa application. This forum post explains that the USCIS wants simple org charts with just the names of people and their positions. No need to complicate things with division names and dotted-lines. Stick to a basic hierarchy that shows how the applicant works as a manager within a chain of command that ends with the CEO. Number of employees inside the U.S. Number of employees outside the U.S.
Before you go off searching for the right org chart software, know that OrgWeaver does all of these things and you can create a free account quicker than a few Google searches. L-1 Visas can be a pain, but the reward is definitely worth it for your business. If you know what to expect from the process, have the right org chart tools and a good team, then you can get through the application without so much pain.